The trip to Mt Fuji and the hot springs was definitely a once in a lifetime experience. The bus ride was very informative. We were so lucky to have a beautiful sunny day so we could see the mountain. However, we could not go up the mountain because the road was closed off due to slippery roads. We still had many chances to take photos of Mt Fuji though. Lunch at Lake Kawaguchiko was very peaceful because the town is very small and quiet. Lake Kawaguchiko is one of the Fuji Five Lakes (you can go to any of them to see Mt Fuji but our tour just included Lake Kwaguchiko) near Mt Fuji. My friends and I were actually the only onces who opted out of the BBQ lunch but we still enjoyed ourselves by having a hot bowl of noodles to warm us up from the cold. On our way to the hot springs, we were so nervous because the tour guide kept telling us how we were not allowed any clothing or towels in the bath. We were only given a small, thin towel to place on our heads. In the end, the experience was not so bad because the reason no one can bring anything into the bath was to keep the onsen clean. In addition, everyone minded their own business so there was nothing to be shy or embarrassed about. We literally walked on ice to get to the outdoor hot springs but it was worth it because the view of Mt Fuji while in the hotspring was amazing. After our refreshing bath at the hot springs, the bus took us to the Gotemba Premium Outlets for some shopping. We did not buy anything because there were mostly expensive designer stores. They had a food court snacked on some food and ate crepes. The outlet had the view of Mt Fuji in the background. After a couple of hours, the bus took us back to Tokyo by 9pm. The tour was great and organized but my only complaint was that my friends and I nearly missed the bus for pickup because we did not realize we had to call viator to reconfirm that we were coming. When I purchased the tickets (the day before), the representative at viator did not mention this so we were frantic and upset. We waited for more than half an hour at the hotel for the bus and ended up having to take a taxi to a bus terminal where the bus was kind enough to wait for us. It was frustrating because we could not use our phone (even apps like Magic Jack and Viber were acting up) and were dependent on one of my friend's phones because luckily she had an international data plan. → The most famous mountain in Japan. → A day trip tour to see Mt Fuji, relax at the hot springs with the view of Mt Fuji in Yamanakako, and shop at the Gotemba Premium Outlets. → Trips can be made by purchasing tickets through viator. → After you have paid and received a confirmation via email, make sure to call the day before the trip to confirm bus pick-up at your hotel. → Hotel pickup via bus is included in the package for selected hotels in Tokyo. → The tour concludes in Shinjuku, Tokyo where you are dropped off. → During the bus ride, an English speaking tour guide (GPS audio guidance available in Chinese, Indonesian, Malay, and Thai) will introduce you to all the sites you will see as you pass through Tokyo to Mt Fuji. → If you have any questions, this is the person to ask. → The tour guide will let you know how much time you have at each area you stop at. 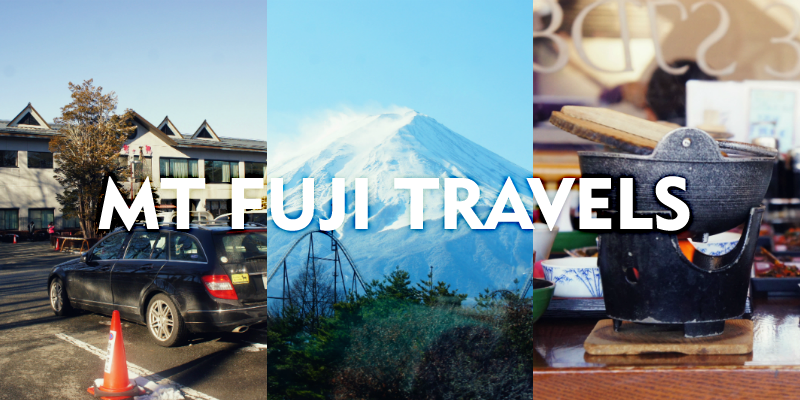 → The first stop is the Mt Fuji Museum where you can take photos and use the restroom. Then the bus will take you to Mt Fuji and up the mountain if the roads are open. → The bus will take you to Lake Kawaguchiko for lunch. → A BBQ lunch option is available (additional cost when purchasing your ticket). → If you do not purchase the BBQ lunch option, there are a few other restaurants neaby (walking distance) that are open. → Hot noodles is a recommendation. → The bus will take you to a local onsen called Beni Fuji no Yu in Yamanakako. → Bath and face towels are not included. Towels can be rented at the facility. → Towels or swimwear is not allowed when entering the bath. → Lockers are available for your personal belongings at the facility (bring change). → The onsen has separate changing rooms and bath for men and women. → There are indoor and outdoor hotsprings at the facility. The outdoor hotsprings give you a beautiful view of the Mt Fuji as you bathe. → A resting area is located in the facility after you are done at the bath. → After the hot springs, the bus travels to the Gotember Premium Outlets where there are name brands like Nikon, Chloe, Anna Sui, Gucci, Michael Kors, Puma, Lego, Yves Saint Laurent, and more. Languages: Japanese is spoken by everyone. The tour guide is a Japanese native speaker but speaks English during the tour. Custom: Bowing is a respectful greeting to elders and peers. Here was the itinerary of my trip that may serve as an example for how to set up your own if you plan to travel. A more in depth description of the itinerary is in the Travelogue below. View from the back of the bus. Mt Fuji sighting in the background of roller coasters. The Mt Fuji Museum we visited for half an hour or so. The view of Lake Kawaguchiko. Eyeing meals that were being prepared for another party as we waited for our food. We we were stopped from proceding any further up the mountain due to risky road conditions. Just arrived at Beni Fuji no Yu for hot springs. The view when we were driving away from Mt Fuji. Many open fields and forests surrounded the villages. The view of Mt Fuji from the Gotemba Premium Outlets. Thankis for sharing these amazing suggestions, it has been a great help. Keep sharing and caring.